What is the NPV Function? The NPV Function is a Financial functions,FunctionsList of the most important Excel functions for financial analysts. This cheat sheet covers 100s of functions that are critical to know as an Excel analyst that will calculate the Net Present Value (NPV)Net Present Value (NPV)Net Present Value (NPV) is the value of all future cash flows (positive and negative) over the entire life of an investment discounted to the present. NPV analysis is a form of intrinsic valuation and is used extensively across finance and accounting for determining the value of a business, investment security, for a series of cash flows and a given discount rate. It is important to understand the Time Value of Money,Time Value of MoneyThe time value of money is a basic financial concept that holds that money in the present is worth more than the same sum of money to be received in the future. This is true because money that you have right now can be invested and earn a return, thus creating a larger amount of money in the future. (Also, with future which is a foundational building block of various Financial ValuationFinancial Modeling and Valuation methods. In financial modelingFinancial Modeling for BeginnersFinancial modeling for beginners is our introductory guide to financial modeling - we cover how to build a model, Excel formulas, best practices, and more. There are many types of financial models with a wide range of uses include: making business decisions at a company, making investments in a private or public, the NPV function is useful in determining the value of an investment or understanding the feasibility of a project. It should be noted that it’s usually more appropriate for analysts to use the XNPV function instead of the regular NPV function. Rate (required argument) – It is the rate of discount over the length of the period. Negative payments represent outgoing payments. Positive payments represent incoming payments. 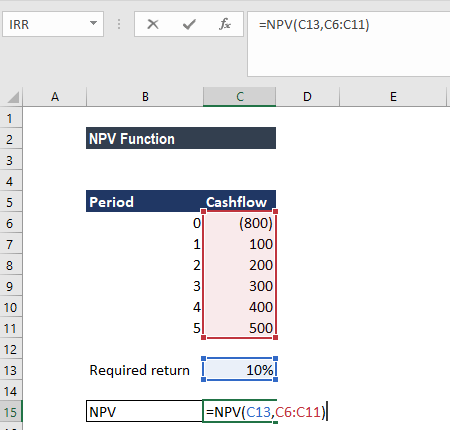 How to use the NPV Function in Excel? The NPV formulaNPV FormulaA guide to the NPV formula in Excel when performing financial analysis. 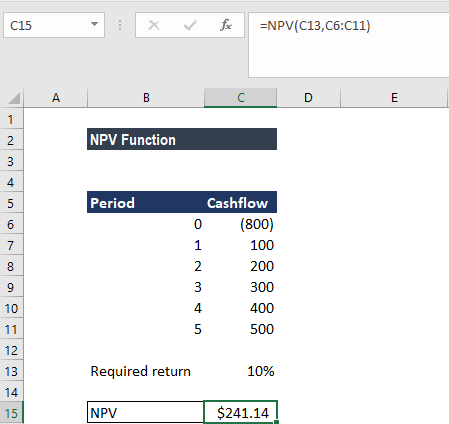 It's important to understand exactly how the NPV formula works in Excel and the math behind it. NPV = F / [ (1 + r)^n ] where, PV = Present Value, F = Future payment (cash flow), r = Discount rate, n = the number of periods in the future is based on future cash flows. 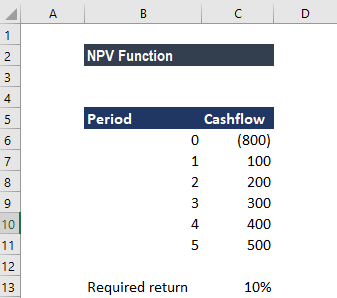 If the first cash flow occurs at the start of the first period, the first value must be added to the NPV result, not included in the values arguments. Arguments must be numerical, or function with a numerical output. Other forms of input will result in an error. Arrays that are used as input, will only have its numerical values evaluated. All other values in the array will be ignored. The input order matters for the series of cash flows. The NPV function assumes that payments are spaced on equal periodic payments. The NPV function and IRR function (Internal Rate of Return) are closely related. IRR is the rate for which the NPV equals zero.